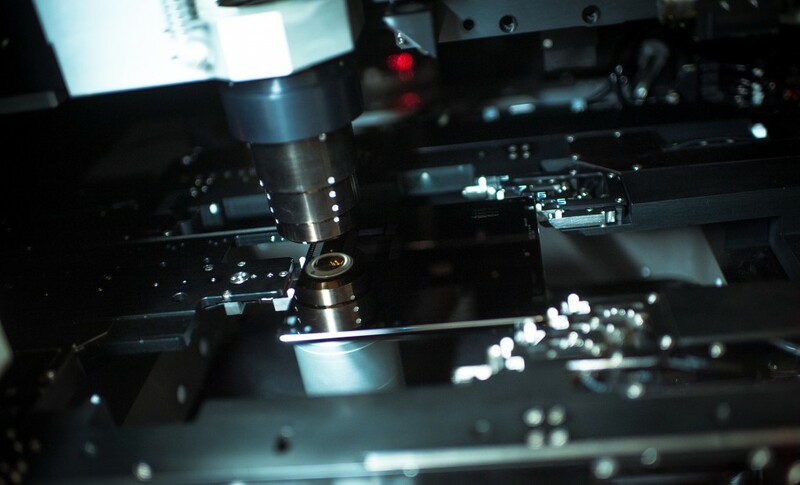 During the course of the last 15-20 years, the practical limits of optical lithography have been extended by four major advances; off-axis illumination (OAI), immersion lithography, optical proximity correction (OPC) and phase shift masks (PSM), known collectively as Resolution Enhancement Techniques (RET). While OAI and immersion lithography are the preserve of the stepper/scanner manufacturer and the wafer lithographer, the other two techniques require a contribution from the mask maker. 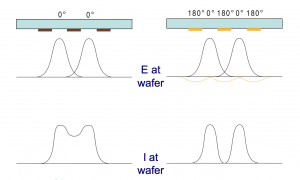 Optical Proximity Correction (OPC) is a technique used to compensate for image distortions that occur during sub-wavelength lithography: printing structures smaller than the wavelength of light being used. These image distortions typically consist of increased corner rounding, line-end shortening and changes in linewidth when located in isolated or dense environments. Lithographers are able to model these effects and using sophisticated software, apply corrections to the design data to correct for them. These corrections take the form of localised linewidth biasing, the addition of serifs to both internal and external corners and the addition of assist bars. As a general rule, these OPC features must be large enough to have the desired effect and small enough not to print. 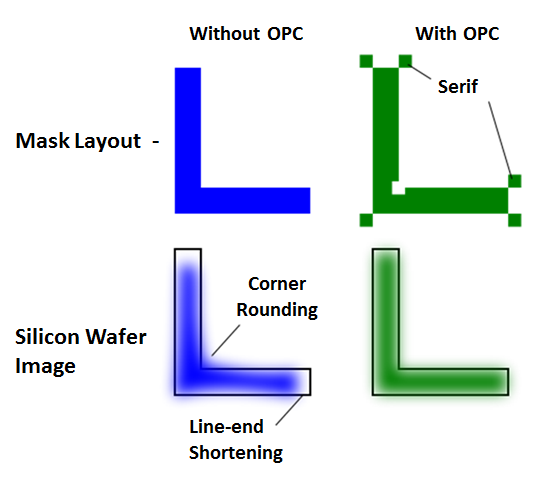 The smaller input addresses (IA) required by OPC techniques can increase mask data file sizes by a factor of 10 and require higher resolution lithography and inspection increasing photomask cycle times and costs. Phase Shift Masks (PSMs) are used to extend the resolution capability and the aerial image contrast of the stepper/scanner. While researchers experimented with a number of different types of phase shift masks, one technique has dominated production requirements, the embedded attenuated PSM. The EaPSM is typically used for the contact and via layers and consists of the device pattern imaged in a semi-transparent (6%) MoSiON layer which has a chrome coating at the edge to support mask alignment and protect the peripheral area from mechanical damage. The 180° phase difference between the clear areas and the partially transmitting MoSiON areas, enhances the edge contrast of the aerial image and improves wafer lithography.